Fantastic response! I NEVER understand those who say they think USing is great & yadda yadda, but that they're going to send their children to school anyways to make sure they can deal with the crappy parts of life...because you know, one doesn't have to deal with them if they aren't forced to go to school...my son is about to turn 6yrs and has delt successfully with a lot of crap and he's never been to school. I don't understand, "I love him/her, don't want them hurt, but I'm sending them to school anyways"...just don't get it. It sounds to me like she is searching. I totally agree that some professions you just have to go to college but it doesn't take 12 years to be ready for college. If her son decided to be a truck driver would that be okay with her? My son is going to start junior college in a couple of weeks and would like to be a lawyer also. He did better on the ACT than his pre-calculus private schooled friend and many public schooled friends! So it can be done and it doesn't take as long as the school system drags it out. I encourage her to search her heart and the internet. There are lots of information pages, forums, and yahoogroups that could help her hash out the answers to her questions. Hope you don't mind my comment Idzie. Just "meeting" you from a link on twitter... You have some great thoughts here, and great first hand experience!! I was homeschooled (an eclectic mix of unschooling and book work) as a child, and have mixed my children's educational experience in both public school and at home. This year, my two youngest will be home, and I'm looking forward to taking an eclectic approach to it. It's what I love about homeschool. It's so easy to tailor to each individual!! Melissa, yes, I am searching, I suppose, though I didn't realize I was. And yes, as my son's happiness is most important to me (rather than some culturally driven idea of "success"), I would be fine if he wants to be a truck driver. I am a lawyer, but I am a part-time government lawyer for who works to live, not a lawyer who lives to work. Michele, I don't think school is necessarily a place that "hurts" people. I think for some people it can have that effect, but for others, it is a positive experience. I would not send my son to school if I really thought it would "hurt" him. If my son turns out to be one of those kids for whom school is not a positive experience, I would not keep him in school. I think Idzie misunderstood me on this point, which probably is because of the way that I worded my e-mail. I want to spend a month in your library. BMM - Don't wait too long! I sent my kids to school on the "Well, we'll just see how it goes" program. Two years later I had a 6yo who was having suicidal thoughts. Her despair came on SO fast. Two months from bright and bubbly to writing a "Things I Hate" list with herself at the top of it. 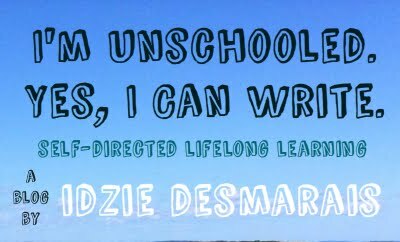 We started unschooling when our oldest was in 4th grade and our youngest was in 3rd. It took about five years for the last obvious remains of the school damage to heal. Math, in particular, was positively RUINED for them by school. After loving math games as toddlers, they both started coming home with "I hate math" comments. So sad! If I had it to do over again, neither one would have set foot in a school. Think of it this way: Just as it's never too late to homeschool, so too is it never too late to send them to school. Start with the known kindest path. @Michele: Yup, I just don't get it either. @Rachel: Thanks for your comment! @Will: *Laughs* I love discovering books in my own house that I never even knew we owned... Just today I said I wanted to get out some Calvin and Hobbes comics from the library, only to be told that we own a bunch! @Ronnie: Thank you very much for sharing your story . Hearing that makes me incredibly sad, but I think that's definitely very important for a lot of people to hear! @Eli: I find the history of the school system to be both fascinating and horrifying to read about. I'd be very interested in that video, but the link is messed up! If you read this, could you possibly re-post it...? Thanks! LOVED what you said here. I've never thought about unschoolers being exposed to more real world than schooled people, fantastic response, so glad you made the time to respond to this person, thanks, some really great stuff here. Love this! I am a mom to 4 ages 9, 6, 2 & 5 months, all unschooled. We know children who are unschooled, schooled at home, public schooled & everywhere in between. The unschoolers all seem to have a maturity beyond their years, not to mention strength in their goals I never had as a public school kid. Thanks for sharing your thoughts! Very well written! "My kids are not uneducated, just unschooled!" awesome! i learned so much here. you are one seriously talented young woman, including wonderful writer - clear, concise... i'm jealous of your skills! i'm totally gonna unschool my kids if i ever have any! i love it. it seems to all fall in line with living more consciously, living in the moment. we are all capable of so much more than we give ourselves credit for. i especially loved your paragraph that included: "I'm a healthy, happy individual who has the confidence to interact with a world where many people, and many institutions, are trying to undermine my dignity and sense of self." and "They've also learned that external validation is the only sort of validation, and that you must always live up to another persons expectations."